- So for the past few years I keep reading about the advantages of a mechanical keyboard but mostly thought people were nuts to spend $100+ on a keyboard. Well, I understand completely now. The real tangible improvements to the typing experience can't be overstated enough. You just have to try one (and longer than just at a store) to fully appreciate the improvement. - I'm not the fastest typist out there but I do ok with around 85 wpm on typeracer.com. I love this site. It's like my new favorite game since getting the keyboards. Yes, that is plural. - mechanicalkeyboards.com is a good place to purchase but they tend to sell out quite often. Just make sure you check the Incoming and Just Arrived links on the front page to get an idea what's available and when. CM Storm Quickfire Rapid-i TKL ($135). I have this on my gamer box. Ducky Zero TKL (DK2087) ($91). Computer in the study. Ducky Zero DK2108 ($92). Taking this one to work. - Tried a few different ones and liked Cherry mx brown the best. - o-rings make it nice and quiet which I prefer. Though it does feel a bit mushier I guess. - Man this thing is heavy. - Cheaper and locally available. Only $105 at best buy so if I don't like it back it goes. I was eyeing the corsair rgb k70 but those aren't even out in brown yet (just red). - It actually works just fine with my usb linkskey 4 port kvm. I was really surprised by this. Macros work too on the gamer machine with the logitech software installed. - Works fine with my macbook pro too through the KVM. I hope the keys don't break or the LED lights burn out but other than that I'm really happy with it. At least it has a 3 yr warranty. Hard to believe I've been using a membrane for the past 20+ years. I had no idea what I was missing out on. - Still really enjoying the g710+ but mostly coding this week. - I looked at the code keyboard but was hesitant on using clear vs brown. I've never felt a clear so I'm not entirely sure I would like it. - Ordered the Cooler Master QuickFire Rapid-i TKL from newegg since I have free shoprunner (american express deal) which gives me not only free 2 day shipping but free return shipping too. This should arrive tomorrow. It was kind of pricey at $130 (after $10 MIR). I don't really need all the fancy lights but all the cheaper ducky TKL ones were pretty much out of stock in the brown. The older cheaper CM was also out of stock. - Ordered the Ducky Zero DK2108 Mechanical Keyboard (Brown Cherry MX) from mechanicalkeyboards.com for $92 shipped. Now that I'm spoiled I can't stand typing on a membrane at work so yeah this will be my work keyboard. I went with full size since I mouse left handed at work but right handed at home. Yes it's odd but I do that to stop some RSI issues I was having. It only took me a year to train my left hand to mouse. So the 10 key pad isn't really an issue at work. So I'll use the CM and the g710+ for a week and decide if I prefer TKL or full size and return one of them. I'm thinking for home I'll probably prefer the TKL. So my advice to everyone is if you don't have like $200+ to blow on freakin keyboards just don't ever try a mechanical....EVER! Got my CM Quickfire Rapid-i TKL. It's so much smaller than the g710+. Without the o rings it's quite a bit louder and the longer travel distance is going to take a bit getting use to. Maybe I'll buy some o rings if I don't get use to it. I have so much deskspace now. It is nice to have my mouse closer and the keyboard centered directly in front of me. One thing though I couldn't power this keyboard + my logitech gaming mouse at the same time through my usb kvm. It worked fine with the g710+ though. Once I swapped in my logitech m510 on the kvm it worked fine. I moved my gaming mouse to be hooked directly up to my gaming rig so all is good. I'll try and put in some time in with this TKL over the weekend and see how I like it. WTF: o-rings are $18?????? Are these people high? Man the g710+ really is a bargain. Early impressions. I'm really digging the TKL form factor. It's so much more comfortable to have the keyboard centered in front of me and the mouse still close. The CM is definitely quite a bit louder especially the space bar. But since this is my home keyboard I don't mind so much. I might have to get o-rings for the ducky that I'm bringing to work just so I don't drive the co-workers crazy. The lights are kind of neat to mess around with. The key caps pick up finger oils easily so it looks shiny and feels a bit slippery. I actually like the more matte finish of the g710+ which I think looks and feels better. As far as how the typing feels I think I slightly prefer the o-rings though it really doesn't make that big of a difference to me. I tend to bottom out so it's a bit harsher on the CM without the o rings. Ducky Zero DK2108 in the house! I like it!!!! You can toggle 6 key or nkro which is nice for compatibility, and it plays nice with my KVM. You can also disable the windows key if you want. I like the key caps better than the CM. It has a slight texture to it and doesn't feel as slippery. Also, the spacebar is quieter so I guess the stabilizers are different? Actually, overall the ducky is quite a bit quieter than the CM. I'm not sure why since they both have cherry mx brown. I guess it's the sound made when I bottom out. So after a few more rounds of typeracer.com it seems I actually type faster on the CM (about 5 wpm on average). Not sure why. The two keyboards do feel different in subtle ways. but in the end I went with the red ones which are a bit softer (40A vs 50A) and thinner (.2mm vs ??? but reviews say they seem thicker than .2mm) to preserve the feel as much as possible. The thickness is just right. OK, I'm DONE spending money on this. Well, until I pick up another keyboard sometime in the future for the study. But that is lower priority. I must really stop now. Oh and the g710+ is boxed and ready to be returned. I really do like the TKL length a LOT. I have a fun evening ahead. It's like quality bonding time with my keyboard. UPDATE: Took a bit less than an hour but I'm loving the o-rings. So much more quiet, I like the little bit of spring I get, and my wpm went up about 5. Oh and my spacebar doesn't rattle nearly as much anymore. Update 2: finished the ducky in about 30 min and that was with more keys so yeah I got faster. My ducky zero TKL finally arrived. I've already put the o-rings on this time I carefully seated each one with tweezers. I went back and spot checked the other 2 keyboards that I already put o-rings on and they seemed fine with the put it on and mash the keys to seat the ring method. Anyways, I really think the ducky is a great value. 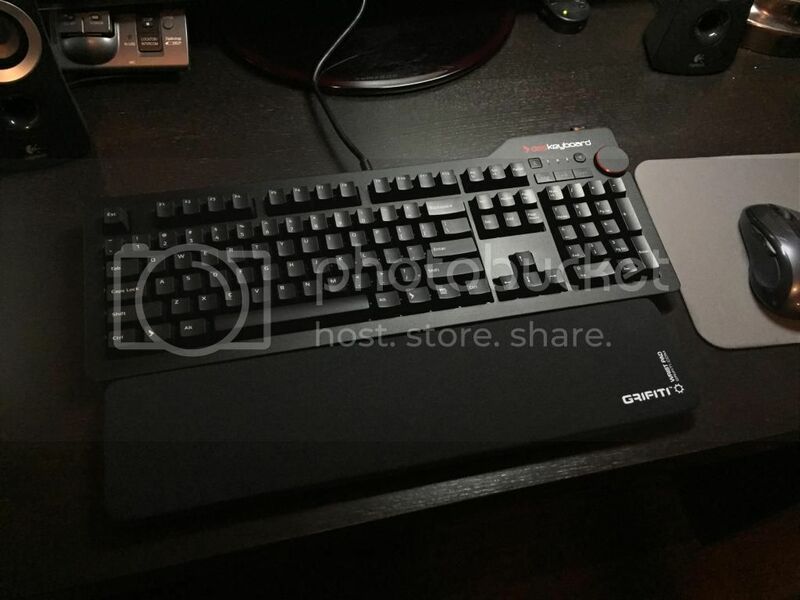 For $91 it has all the critical features I look for including win key disable and NKRO/6KRO toggle. 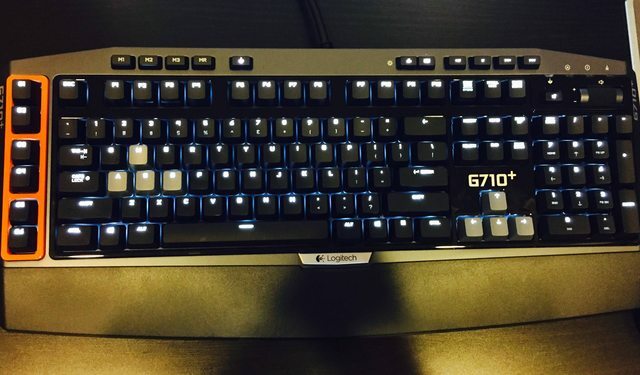 It has LEDs on all the keys that toggle. It works great with my KVM too. Granted, I think the cm storm feels a bit nicer, has a nicer finish, and is heavier to boot. I also like how it feels to type on better. It's subtle but different from ducky even though both use cherry mx brown and have the same o-rings. But is it $40 better? IMO, no. Das Keyboard 4 Profession (cherry mx brown) refurb from woot for $120. Installed the usual wsad red o-rings. The stabilizers were a bit tricky to work with but this youtube video helped. It's really pretty. It feels nice too. The only thing I'm not too crazy about is the plastic ruler used as feet. It seems a bit gimmicky and is pretty slippery. Hmmm that's $600+ in keyboards alone not counting o-rings, wrist pads, etc. in like 4 months. - My youngest is still on an iPad 2, and it is REALLY slow on iOS 8. My old iPad 3 actually felt ok. So this upgrade was as much for me as it is for him. - Super light and thin. It's so thin it's getting a tad hard to hold. - It's really fast. Unlike the mini refresh this one got a new CPU, and man can I feel the difference. - TouchID FTW. I LOVE touchID. - I've ordered the the iCarbons back only Titanium color this time. I also picked up an apple smart cover. I find this combination gives me some nice scratch protection with minimum weight added. - I picked up this tempered glass screen protector from ebay for around $11. I hope it has good adhesive. I should have tomorrow. Highly recommended. It's a really nice iPad but it's more of the same. If you need some product refreshing around the house like I did I say go for it. I wish they would come out with an iPad Plus since I use the iPad for all my sheet music. A little larger model would be nice. - Stuck my old 4GB vita memory card in there and tried out Thomas was Alone (local native vita game). Worked fine. - Paired up with my dualshock 4 without issue. This means no more compromises as far as controls go when streaming from the ps4. - 720p/1080i max resolution so it seems a bit comically low res for a streaming box. Everything is gigantic on 720p in the menus. In game it's not so bad. 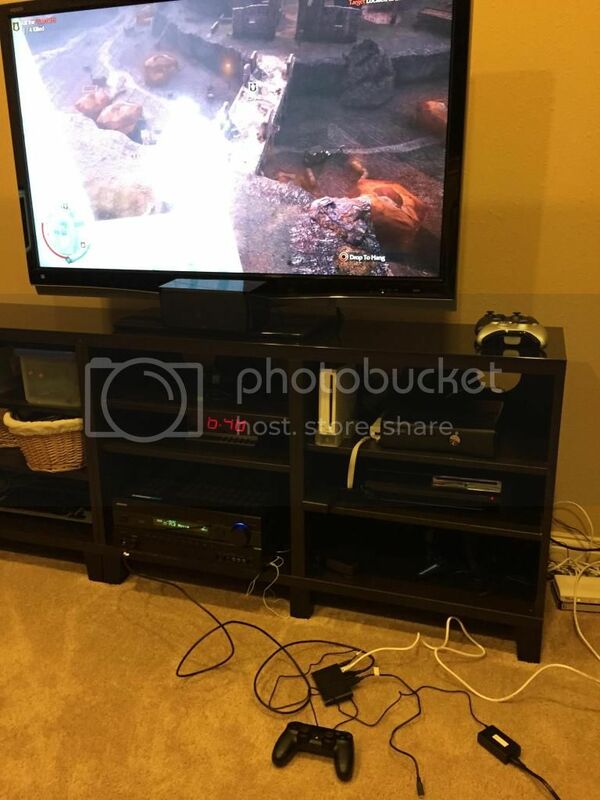 - Streaming Shadow of Mordor over gigabit ethernet on both ends. It's about as smooth as you can hope for but for a game like this I think it's very sensitive to input lag. I'm not sure why but the input lag feels worse than the vita. Maybe it's the added extra ms lag that happens when going through a receiver and to an HDTV. I'll try it on a different TV later tonight when I move it to it's permanent home. At least it looks and sounds good though. - Tried velocity 2X for a bit over streaming and it felt quite a bit better though the input lag is still noticeable but not nearly as bad. - There are barely any apps right now, not even netflix. I think there are like five and I only recognized crunchy roll. - I power cycled all my network equipment and switches just in case. - FYI, I did update the firmware to latest (first thing I did after initial setup). - There are some framerate issues. I'm not sure if it's just the bigger screen so it's more noticeable or because the client is rendering out to 720p vs whatever the vita screen resolution is but it's quite noticeable. Think chromecast when casting a tab (but not quite that bad but you get the idea). I have resolution set on auto so I need to double check to see if it's using 720p. I'll try forcing 1080i and even 480p later tonight to see if that makes a difference. - The input lag feels closer to say 80-100ms. < 40ms = local for me and > 130ms = modern hdtv's NOT on game mode. So it's definitely noticeable but depending on the game it has a different impact. I played some Tomb Raider definitive edition and it was pretty playable except you have a bit less time to react to QTEs. TD on cod ghosts was a bit of a mess. The reduced framerate makes aiming a bit jerky combined with the increased input lag makes this a pretty horrible experience. 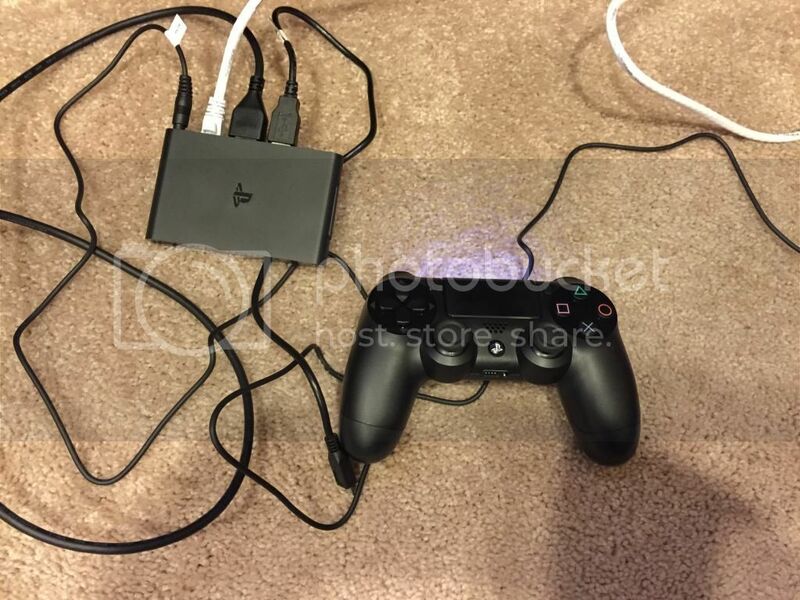 - I think it supports up to 2 controllers. - It has 1 GB of internal storage but as soon as I popped in the 4 GB vita memory card it basically disables the internal memory. So you can only use one or the other but not both. Yeah, not sure who this device is targeted for. If the streaming performance was better I would probably pick up a few more to sprinkle around the house. If you want to play vita games then you really should just get a vita which has full app support. Right now I can't really recommend this little box for anything really. Having full dualshock 4 support is rather awesome though. I have my fingers crossed that maybe forcing 480p output will improve things overall. I'll trade resolution any day if I can smooth out the framerate and responsiveness. What is odd thinking back to when I tried sniper elite 2 on playstation now during closed beta using the ps4 as the client THAT experience felt better than streaming locally to the ps tv. It almost feels like the ps tv doesn't have enough juice to be a proper client at the given output resolution. I'll also test the ps tv on wifi just for completeness though I don't see how wifi is going to beat out gigabit ethernet. Here's the interesting aspect though - re-running the latency test to measure the amount of time between the same frame being rendered on PS4 and PlayStation TV still produces a lacklustre six-frame deficit: 100ms. The difference is that the lurches in response are significantly reduced. Moving from a wireless to a wired connection simply gives us the fastest speed possible from the hardware and consistency in the transmission and reception of data. HAH! My off the cuff latency spidey senses are working well. They measured 100ms. - Forced it to 480p. No real noticeable difference in feel except things are uglier. - Tried out last of us hd and it was ok. These 3rd person action games are definitely more forgiving of the lag. I went back and tried some more tomb raider at 480p. Verdict is just leave it at automatic (720p). - Tried out Killzone mercenaries. It plays well but with the graphics blown up it looks like a low res ps3 game that was up res'd to 720p with a lot of aliasing issues. it's not pretty but very playable. Yeah, I'm tempted to box this thing up and return it. I might keep it in hopes that after a few firmware updates the streaming gets better but I'm not hopeful. Very disappointed. Maybe this is for people who are less sensitive to input lag and slightly jumpy framerates but apparently I'm not one of those people. I'll do one last test when I move it downstairs. I know the onkyo receiver I have it hooked up to while testing does the upresing to 1080p. I'll be curious to see how it is on my yamaha receiver which will pass through the 720p to the tv. NOT Recommended. Tested it downstairs in it's final location. No difference. - After the latest firmware update there is a new option on the client settings (ps tv or vita) to set high framerate. This really smooths things out and removes all the micro stutters. It's a lot better but that input lag is still present. It's a step in the right direction though. - So I picked up a new macbook pro to replace my old mid 2010 15". The main reason is I really wanted proper dual monitor setup and the old 2010 just doesn't have it. It has only 1 mini display port. I tried one of those Diamond BVU195 USB to DVI adapters which worked ok but since it uses your existing cpu/gpu to virtualize another video card it killed performance. If I did anything on the usb display my cpu would spike to 90%. If you are doing some light computing I guess it was fine but I was planning to start some Swift development and I need more cpu cycles for compiling while looking at reference and video tutorials on the other monitor. - I thought hard between the 13" and the 15" but finally decided to go 15" since I'm planing to use this for development and the extra screen relastate when not docked to my 2 X 27" asus ips monitors would be helpful. I also wanted the biggest cpu jump I could get and I had to go 15" for quad core. I custom configured a top of the line one with the 2.8 ghz core i7, 16 gb ram, nvidia 750m, and 512GB ssd. I couldn't quite swallow the $500 upgrade price to that 1 TB ssd. - I'm using the amazon basics mini displayport to hdmi adapter and the built in hdmi port. It works well including audio over hdmi. - Performance was quite a nice speed bump. xcode builds nice and fast now. - I also run a full visual studio development environment inside a virtualbox vm (windows 8.1 enterprise) and that runs great too on the ssd. - I tried a few games like guild wars 2 and diablo 3 and both run well on the 750m. I ran borderlands 2 off the usb 3.0 external hard drive on the exFAT partition, and it ran great. - I picked up a seagate backup plus slim 2TB. I decided to install bootcamp onto an external drive and save all the ssd space for osx and vm. I followed this guide which is quite a few steps but does indeed work. I used a real windows 8.1 machine for all the windows steps though. - To get imagex.exe I grabbed the windows 8.1 ADK. You only need to install the Deployment Package which is really small to get the imagex.exe. I used a msdn windows 8.1 enterprise iso which I installed to a 1TB partition. I created a second 1TB partition and formatted it to exFat so I could share between OS's. I figure I could install some mac steam games on the exFat partition. - Speeds aren't bad over usb 3.0. They keep up with the 2.5" hdd just fine. - I bought a second 2TB external drive. I got a good deal on a seagate expansion drive. These aren't quite as nice or as slim as the backup plus slim one but it's still nice. I formatted this one hfs+ and use it for time machine backups. - I picked up a suction cup hanger. What you do is stick it to the external hdd then hook it over the top of the macbook screen. That way it's easier to move around with the mbp and the hard drive just goes with you. It's a bit ghetto but it works. - Actually, a sticky car dash mount might be a better solution. - Upgrading to Yosemite went smoothly. - I love Karabiner which is a great keyboard remapper. If you use a pc keyboard with a mac and want your navigation keys like home, end, and windows, alt keys mapped properly go install this. It has some nice pc keyboard specific settings that make this a snap to remap and setup. - The bottom of my old mac kind of got scuffed up so I'm going to try a top+bottom iCarbons set on the new one. - The screen is sharp and beautiful and you don't see any scaling artifacts. It really does look perfect. If you want to run at native give SwitchResX a try and get ready to hold the mbp about 5 inches from your face to be able to read anything. Display Menu in the app store is pretty nice too and there is a free version. - This ikea napkin holder makes a nice dirt cheap vertical stand. Some tips for those wanting to install windows 10 on a usb external hard drive (clean install ONLY) on a macbook. You CANNOT upgrade from a previous version of windows on an external hard drive install. No matter what I tried it wouldn't work. Only a clean install worked. - I upgraded to a 960GB crucial M500 SSD and I put it in this USB 3 enclosure. The only thing you need to install out of that is the deployment package. - I installed windows 10 pro from the msdn iso. - Bootcamp 6 drivers are created on a usb flash drive from the mac os x side. Just run bootcamp assistant and it will download the latest drivers and write them to a usb flash drive. - I went ahead and still installed geforce experience and let it download and install the latest video drivers. I actually went ahead and "donated" to register them. I also paid and registered for it but there are free open source alternatives (haven't researched them though). Speeds are crazy fast over USB 3. Crystal Diskmark was showing 450 MB/sec reads and 200 MB/sec writes. iPhone 6 (128GB AT&T): Bigger is Buggier? - We upgrade our phones every 2 years so we skip the s models. - The 4.7" felt big at first but after about an hour of use it felt normal and my old iPhone 5 looked and felt tiny. It's still very easy to operate. Reachability felt pretty gimicky. I'm not sure how usefult it is on the plus but on the regular 6 I never use it. You can disable it in the settings if you want to. - Build quality are excellent. - I picked up this case from amazon for $2 shipped when it was on sale. It's not half bad. It's one of those new hybrid cases: the sides are grippy but the back is a hard plastic. It's very minimalist. Just keep in mind it doesn't have much of a lip on the front but I don't go laying my phone face down anyways so that part doesn't bother me. - I'm going to give this tempered glass screen protector a try. It hasn't arrived yet. - The 240 fps slow mo video shooting is neat. I tested it on our finches. - I'm using the tunebelt armband for running. It fits well just note you have to remove the phone from the above case before it will fit. - I'm using another Ibera bike mount. This one fits the iPhone 6 pretty well and you can even leave it in the case. Here is a write-up I did on reddit on some other options I was considering. - I tried a few keyboards but settled on swype for now. I like swiftkey and used it on android but it seems to take a split second longer to load than swype. That bit of load lag time is annoying. I'm not overly concerned with privacy at least with these two companies. I like swype type typing for the most part except in cases where your finger doesn't glide smoothly over the glass (after a hard run, or your fingers just aren't very clean). In those cases the hunt and peck on these alternative keyboards never seem as good as the default one. - 1 password + touchID is wonderful when it works. TouchID is such a nice everyday game changer IMO. - More apps need to support extensions in general. I'm sure there will be more as more get updated. - Widgets are nice but I still don't use them much. - I love having the 128GB options. I'm always running out of space. - 3rd party keyboards still don't show up as default all the time. UPDATE: Still an issue in 8.1. - 1password doesn't always allow me to use touchID. I have everything setup properly: keychain, 30 days for master password, etc and it is still hit or miss. UPDATE: 8.1 seems to have fixed this for the most part. - Bluetooth issues. Lots of reports of having issues pairing with your car. It worked fine with my 2007 Acura TL Type-S but it's having some issues with my MIO Link Heartrate monitor. It constantly connects and disconnects over and over so I get sporadic readings in my apps. I tried pairing it with my iPhone 5 and it worked flawlessly so I know this is an iPhone 6 specific issue. iPhone 6 pairs fine with my wahoo bike and cadence sensor though. MIO is aware of the issue (I emailed support) and they are working on a solution. UPDATE: I exchanged the mio link with another one and this new one seems to work fine. So I guess I just got a bad one. - None of these are deal breakers but added up it's a constant annoyance and reminder how buggy this release was. Highly recommended. I love the new size though it's really thin and rounded so I would recommend a case just so it's easier to hold. Also, I don't like how the camera sticks out so a case helps there too so you can lie it down flat. It's very fast, twice the storage, and a bigger screen. I just want these bugs to be worked out sooner than later and maybe they could have tossed in a bit more RAM too. Other than that I'm quite happy with the phone.